Welcome to Madison Elementary! I am excited to serve as the Assistant Principal of such a warm, welcoming, and dedicated faculty & staff. This will start my 17th year in education. 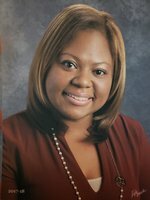 Prior to joining the MES family, I served as a Special Education Teacher, Reading Coach, and a School Counselor. I absolutely love teaching and learning! I love pouring into others and sharing my knowledge and experience. I am married with twin 4 year old boys that keep me busy! I am looking forward to another school year filled with building new relationships and leaving a legacy that inspires others.